Maps are one of the most important types of documents associated with exploration. A map is a graphic representation that facilitates a spatial understanding of things, concepts, conditions, processes or events in the human world. They are used by explorers to help find their way. They are also prepared by explorers to document or record what in fact they discovered. There are many types of maps, each determined by the purpose for which it is designed. The road maps that your parents use are way-finding or route maps that guide them from one place to another. The daily weather charts that you see on television are special-purpose maps of natural phenomena that help people plan whether or not they will travel to a particular place! The geographical maps in your textbooks show the distribution of various things or processes over large areas. What types of maps do you think explorers used and prepared? The first step an explorer takes in preparing a map is to determine his or her location. The location of any point or place on the earth's surface can be understood only with reference to its distance and direction from another point or place. The easiest way to do this is to use familiar landmarks. Your bus driver uses landmarks everyday as he or she drives you safely to school. You may observe these landmarks or guide points as well. They may be in the form of man-made objects representing the human or cultural landscape such as theaters, churches, and synagogues. 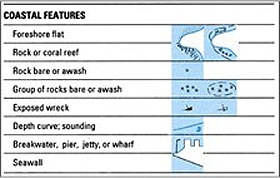 They may be topographic or physical landforms such as rivers and hills. Or they may be prominent plants such as large trees and distinctive shrubs. Such landmarks provide a relative location or mental frame of reference, and are useful for guiding people over small areas. Explorers and mapmakers, however, must determine the exact location of a place or point on the earth's surface so that whoever uses their maps can easily find any site depicted without depending upon another person for guidance. This is done by dividing the earth's surface into a grid system of imaginary lines similar to the way a football field is marked off to help officials and spectators locate the placement of the football with precision and accuracy. When applied to the earth's surface, these lines are designated parallels of latitude and meridians of longitude. The transfer of this imaginary grid system of parallels and meridians of the Earth ( a sphere) to a small, flat map, however, cannot be done without distorting in some way the map's shape, area, distance or direction and changing its scale. These distortions can be easily observed by drawing a grid system of parallel lines on a large grapefruit and then laying the peeling flat. Once the map's projection and scale are determined, the next step undertaken by an explorer is to add features of the physical, natural, and cultural landscapes that will most accurately and vividly represent the pattern and texture of the area mapped. This is done by simplifying (generalizing) the features to be shown by using symbols. Map symbols are small graphic images that stand for something else. They may be depicted by pictorial images, abstract combinations of points and lines, or tonal shading and color tints. For example, an explorer might show an Indian village by using a miniature picture of a teepee. The final step in the preparation of an explorer's map is selecting and applying geographical names that identify relevant features, landmarks, and places. Geographical names are fundamental elements of maps. They also provide important reference frameworks in our daily life. 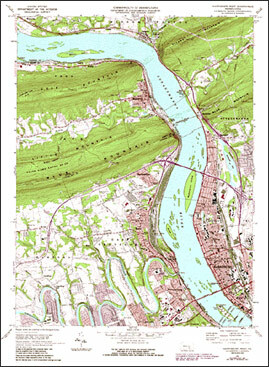 Two hundred years ago when Lewis and Clark set out to explore the Far West, the basic principles and techniques of scientific mapmaking were well established. As early as the second century A. D. the Greek geographer Claudius Ptolemy prepared instructions for the construction of maps using latitude and longitude as a geographical frame of reference. During the great age of European seagoing exploration, Portuguese, Spanish, Italian, Dutch and English navigators developed and improved a variety of instruments to measure one's position on the Earth's surface. By 1800 overland explorers relied primarily upon compass route mapping to prepare their maps. This is also called "dead reckoning." In compass route mapping or "dead reckoning," mapping is based upon determining direction and distance along the line of exploration. The direction or course of the route is determined by magnetic compass, an ancient instrument invented in China and used in Europe since at least the eleventh century. By the beginning of the nineteenth century, mapmakers were aware that their compasses pointed to the magnetic north pole rather than the geographic north pole, and that they had to make corrections for this variation. Several magnetic variation maps of North America had been published by 1804 to help surveyors make these corrections but none existed for the Far West. In rivers or streams they used log-lines or counted paddle-strokes. On land they counted their steps (pacing), and later, used viameters (odometers) attached to a wheel. For more accurate measurements, some explorers also carried a one-hundred link chain called a Gunter's chain. This chain measured precisely 66 feet in length. The height of the mountains and hills along the route were often measured as well, using an instrument called a barometer. 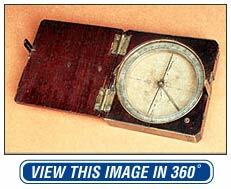 Nineteenth century explorers checked the accuracy of their compass bearings by celestial observation. This is called celestial navigation. In the Northern Hemisphere, latitude was determined by measuring the altitude or angle of the North Star, Polaris, from the horizon, with finely scaled brass instruments called octants or sextants. Determining the altitude of Polaris on land required another instrument called an artificial horizon since the true horizon is generally obscured. Longitude was more difficult to determine during a cross-country expedition. The most accurate method is to compare the time of a portable clock or chronometer set according to a prime meridian with local time determined by celestial observation. The results were then calculated by reference to astronomical tables of transits (ephemeris) by experts known as computers. Unfortunately, the marine chronometers of the period were too bulky and sensitive to carry overland and pocket chronometers were often too fragile to survive long distances. Local time in North America was determined by measuring lunar distances (the distances between the moon and certain stars) and calculated according to Nautical Almanac and Nautical Ephemeris, first published in England in 1765. Upon completion of an exploring expedition, the field maps would be redrawn on one sheet at a smaller scale and then turned over to an engraver for publishing. Today, we are surrounded by maps. We see them daily on television, in our newspapers, in our books, and on our computer screens. 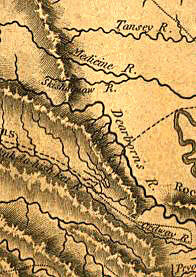 The detail shown on a map was also more limited in 1800 than today. Large areas of maps were often left blank for lack of information, or they were filled in with decorative lettering or fanciful pictures. If terrain features such as hills and mountains were depicted, they were generally shown in the form of "hairy caterpillars" or simple drawings of hill forms. These techniques were well adapted to both woodcut and copper engraving. Maps also reflected the lack of accurate, detailed field surveys available to mapmakers. Since no standards existed to guide mapmakers, symbols and lettering varied greatly from map to map. The selection of the prime meridian also varied from place to place before the adoption of Greenwich, England in 1874. 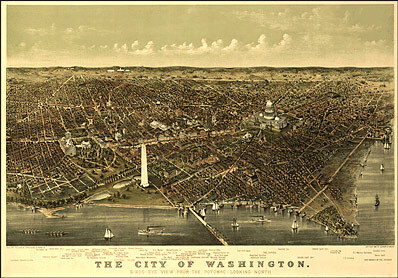 Often it was measured from the nation's capital or from the city in which the map was published. 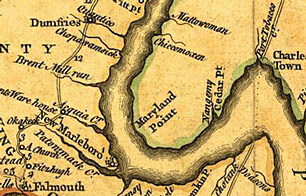 In the United States, map publishers often used Washington, D.C., as the prime meridian during the first half of the nineteenth century. Most of the maps available in the United States at this time were published in England or France. Because the United States had few trained mapmakers in 1800, many of the first American cartographers were recruited from Europe or were former military officers. Copyright 2000 Smithsonian Institution and EdGate.com, Inc. All rights reserved.